SSG Vojtasek stands well apart from his peers in the service he has rendered to his unit, and the Ground-Based Midcourse Defense program. 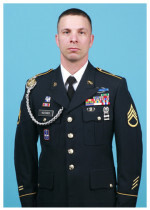 In his primary duties he serves as the 49th Missile Defense Battalion Chemical, Biological, Radiological and Nuclear NCO. He performs his full-time duties and responsibilities supporting HHB and the Battalion S-3 and also is a recent graduate of the GMD Qualification Course. It is in the capacity of ACM that SSG Vojtasek has excelled as a Missile Defender. Not only does SSG Vojtasek serve as a qualified Fire Direction Center Communications Operator, but is also dual certified as a Weapons Operator. During the last gunnery table certification, he lost fewer points than any other member of his crew. Despite serving only 90 days on crew, evidence of his technical and tactical expertise is so adept, he was selected as a member of the Battalion Operational Readiness Evaluation team. SSG Vojtasek also is a very well-rounded Soldier, maintaining an APFT score about 270 for eight consecutive tests, receiving awards for state marksmanship competitions, representing the Alaska Army National Guard during regional Best Warrior Competitions and graduating from the Introduction to Space Course. As an ACM, SSG Vojtasek has set a superior example to other Missile Defenders in the 100th Missile Defense Brigade and Space and Missile Defense Command. He has reached out beyond his normal MOS duties and responsibilities to support missile defense operations in a capacity and with the expertise few others achieve.